Green Shorelines come in many shapes and sizes depending on site conditions (like slope, proximity of structures to the lakeshore, and wave energy). Planting shoreline vegetation can improve habitat and lake views on almost any property. A full beach restoration provides the greatest habitat benefits, but it may not be feasible for all properties. Below are some examples of different Green Shoreline approaches. Use our interactive decision tool to find out which shoreline approach would work for your property. Gravel Size: Although many people think of sand when they think of beaches, rounded gravel (1/8" to 2") will resist erosion better than sand, and provide more natural habitat. 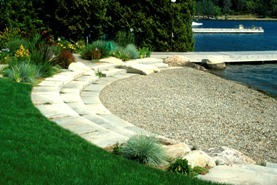 If you wish to incorporate sand into your design, it should be placed well above the high water line. Bulkheads can be setback along the entire length of the property to create a reinforced full beach or along a portion of the bulkhead to create a reinforced beach cove. Gravel Size: After setting back your bulkhead, you will need to add beach fill (1/8" to 2" rounded gravel). This rounded beach gravel will resist erosion better than sand, so instead of losing property, you will be substituting lawn for beach. Similar to Full Beach and Beach Cove restoration, periodic beach nourishment will be needed. Root wads extending into the water (but no more than 2' below the ordinary high water line) can provide habitat for young salmon. Watch the Green Shores video from British Columbia. 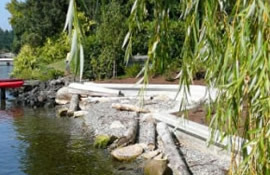 Shoreline Makeovers: See before/after photos of Green Shoreline projects in Lakes Washington and Sammamish. See for Yourself! Green Shorelines demonstration projects at local parks near you. 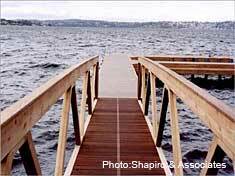 Shoreline Decision Tool: Find out which shoreline approach would work for your property.